I am excited that you are interested in my boot camp classes called “Sweat 30”. Sweat 30 kicks up your metabolism into high gear with simple to do customized 30-minute workouts. (Get in, Get it done and Get on with your day.) Sweat 30 will provide you with an instructor lead 30-minute workout that is perfect for all fitness levels! Sweat 30 is ideal for a wide range of fitness levels because of how easily it can be modified to be more or less challenging. It’s a great total body training routine for intermediate exercisers, even advanced exercisers will break a sweat over the course of this 30-minute training program. Thank you for choosing Young Forever Fitness and Nutrition Coach. We strive to assist clients in achieving their goals of a healthier lifestyle safely! Whether you want to lose weight, enhance your body composition, or become a better athlete, Young Forever Fitness and Nutrition is dedicated to your success. 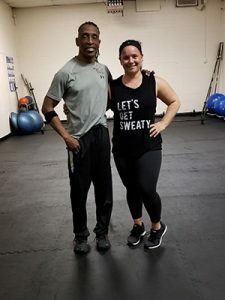 We offer personalized fitness and nutrition plans for all of our gym members, and our unique group fitness classes will have your blood pumping in no-time! Our boot camp classes, also known as Sweat30, will kick up your metabolism in high gear with simple and challenging 30-minute workouts. All of our workouts can be easily modified, making them great for the novice and experienced exerciser. Sign up for a Sweat30 class online or get your free consultation today!